BUTTE®, a rice herbicide, has received federal registration in the USA as well as state registration in California. It will be available to California rice growers for the upcoming 2017 season. Gowan Company, along with SDS Biotech and Nissan have collaborated to bring this product to California rice growers. BUTTE® is a granular into-the-water herbicide that combines two modes of action: an HPPD-inhibitor (benzobicyclon), and an ALS-inhibitor (halosulfuron). 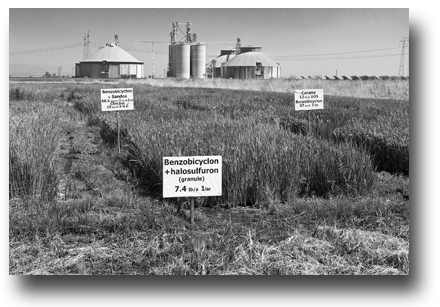 It is the first HPPD-inhibitor available to California rice growers. Since weeds in CA rice have widespread herbicide resistance, BUTTE® offers a new option for resistance management for affected growers, particularly those with herbicide resistant sedges. BUTTE® offers excellent control of many sedges, broadleaves and grasses. For a complete list of weeds controlled and suppressed, please refer to the herbicide label. BUTTE® is applied early in the season, and requires a 20-day water hold period. As always, growers and applicators should follow all label requirements, to ensure the best weed control, and to prevent the development of resistance. There will only be enough product available for 2017 to treat approximately 50,000 acres, so growers interested in purchasing BUTTE® this season should talk to their Pest Control Adviser and the retail location where they normally purchase rice pesticides. The University of California Davis Weed Science Program has been working with Gowan to research BUTTE® over the last several years. Studies on the weed control spectrum and timing began with Dr. Albert Fischer's program, and research on rates and formulations have continued under Dr. Kassim Al-Khatib. The UC Weed Program will continue to look at herbicide combinations that best compliment BUTTE® this year. The trials will be available for viewing at the 2017 Rice Field Day.